Remember the days when getting music meant leaving your chair and driving to a store? Remember having to buy a whole album of filler to get that one great song you heard on the radio? iTunes didn't only change the way music was distributed... it changed music. This is why the upcoming milestone is so momentus. In the next few days, iTunes will reach 10 billion song downloads. That's ten billion with a b. A one followed by TEN zeroes. That's a song for every person on the planet, plus an extra 3,300,000,000 songs left over. 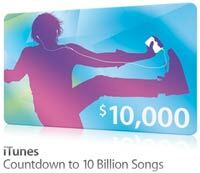 To mark the occasion, iTunes is giving a $10,000 iTunes giftcard to the lucky downloader of the 10 billionth track. Mike and I thought it'd be a fun challenge to try and come up with an accurate educated guess of when the download will happen to increase our chances of being the lucky winner. This file is updated every hour and is a simple one line string. The string contains the timestamp, the current count and the how many songs were downloaded in the last hour. In order to calculate our estimation, we set up a script that logs the newest data every hour from Apple and stores it into a database. With this data, we can analyze the rate of change per hour, every hour and convert Apple's countup counter into RustyBrick's countDOWN counter. We have created a few algorithms and crunched a lot of data and our prediction is below. With all this data at our disposal, we thought it would be fun to do some cool stuff with it. We're nerds for great data sources. For example, here's yesterday's rate of song downloads (in Eastern Standard Time). Now, it's important to note two things. Our prediction will (hopefully!) get more and more accurate as time goes on as we collect more and more data from Apple. So, be sure to bookmark this page or use the widget for the latest info. Also remember that the counter is purely for novelty purposes as it's impossible to tell EXACTLY when the ten billionth download will occur. Apple's counter is only using an hourly feed so we're left to make educated guesses at the end date. Also, even if we were able to get the exact second of the final download... at the time this blog page was loaded, Apple is averaging _ downloads every second.